The Bad News Bears Go to Japan (also known as The Bad News Bears 3) is a Sport-drama film 1978 film release by Paramount Pictures and was the third and last of a series, following The Bad News Bears and The Bad News Bears in Breaking Training. It stars Tony Curtis and Jackie Earle Haley, also featuring Regis Philbin in a small role. This film was followed by a 1979 CBS-TV series, and by a 2005 remake of the 1976 film. Small-time promoter/hustler Marvin Lazar (Curtis) sees a potential money-making venture in the Bears that will help him to pay off his debts. After seeing a TV spot about the Bears, he decides to chaperone the baseball team for a trip to Japan in their match against the country's best little league baseball team. As implied in Breaking Training, the Bears had to defeat the Houston Toros for a shot at the Japanese champs. In the process, the trip sparks off a series of adventures and mishaps for the boys. A subplot involves the interest of Kelly Leak (Haley) in a local Japanese girl, and the cultural divide that comes to bear in that relationship. About half of the original or "classic" lineup of Bears players return (many like Jose Agilar, Alfred Ogilvie, Timmy Lupus and Tanner Boyle are not featured). Three new players are featured: E.R.W. Tillyard III, Abe Bernstein and Ahmad's younger brother, Mustapha Rahim. The film has a 0% rating on Rotten Tomatoes based on 15 reviews. 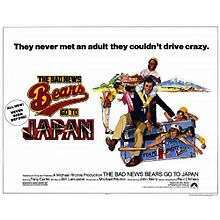 The Bad News Bears Go to Japan was released on DVD February 12, 2002 by Paramount. 1 2 3 Lee, William. "The Official Website of the Yokota High School Alumni Association". Retrieved 19 August 2012. ↑ "The Bad News Bears Go To Japan (1978)". Rotten Tomatoes. Retrieved 2014-07-05.